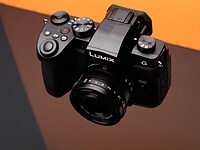 The specs are basically a 7D with 20mp and one less FPS, and some lesser amount of weather sealing. Nice! I wonder if Canon has finally gotten past whatever mental block they were having with the 18mp APS-C sensor. This also begs the question, what could the 7DII possibly be so as not to intrude upon the 5D3 or 1DX? 20mp, 19pt AF, 10fps? What mental block did Nikon have with their 16MP sensor that came out after the Canon 18MP and was only upgraded a few months ago? They've been working on the technology the whole time, and despite on-sensor PDAF not being amazing since they released it, it looks like with the new EOS-M firmware and possibly the 70D they've got it working very well. An APS-C won't intrude on full frame. The 7DII might have the same sensor as the 70D, but maybe not.